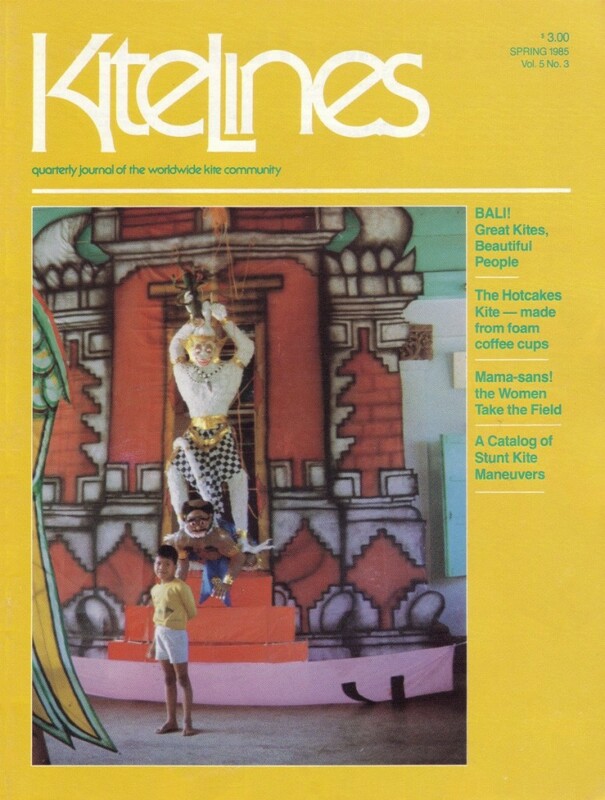 Cover Story: Shakib Gunn’s photographs, drawings and article on the Great Kites of Bali. Features: the true story of the world’s first women’s kite team, the Mama-sans, by Valerie Govig; Bruce Mitton on a Tucson, AZ, Museum of Art kite exhibit, with Sally Hunter and Esther Larson’s execution of a 29.5-foot delta; a visit with Will Yolen, leader of the International Kitefliers Association; IBM’s United Way charity drive flying high with kites; remembrances of Wyatt Brummitt; a kite club update. Departments: Letter from the Publisher: on kites getting us through the winter, and Kite Lines going to computer; What’s New: Kites: the Adrian Conn Dragonfly, the Dyna-Kite stunter, the Tiny Dancer sled, the Flash from Alivola Aquiloni, the Sky Climber from Charmyr Research and Development; What’s New: Books: I Colori Del Vento (The Colors of the Wind) by Angeletti; What’s New: Sundries: Shanti’s new Skybond line of Kevlar and Dacron; Kites Past: Leonard Conover on the Conyne Aeroplane and Charles Siple’s three-stick Jolly Boy; Innovations: the Hotcakes Kite by Ron Petralito, plus a bonus, the Pencil Glider, made from foam coffee cups; Ultimate Questions: a catalog of 30 kite stunts from Michael Allan Jones; Empty Spaces in the Sky: Daniel Flintjer remembers Richard Wohlert; For the Record: Bill Mosley’s 366-days-a-year of kiteflying, a career record by Clyde Smith and a first-flight in the world’s largest desert, in Ahaggar, Algeria; Shopping Around: Lou Kane on good buys in the U.S., Canada, England, Germany and Italy; Best Of Show: Jan Hosking’s Seven Sisters kite, photo by Ted Manekin. It is a few days before the Bali International Kite Festival and this typical kreasi baru (new creation) brings excitement to a young boy in a bale banjar (community center) where the kite was made as a community effort . See more examples of Balinese kites on pages 30 to 34. Photograph by Shakib Gunn.